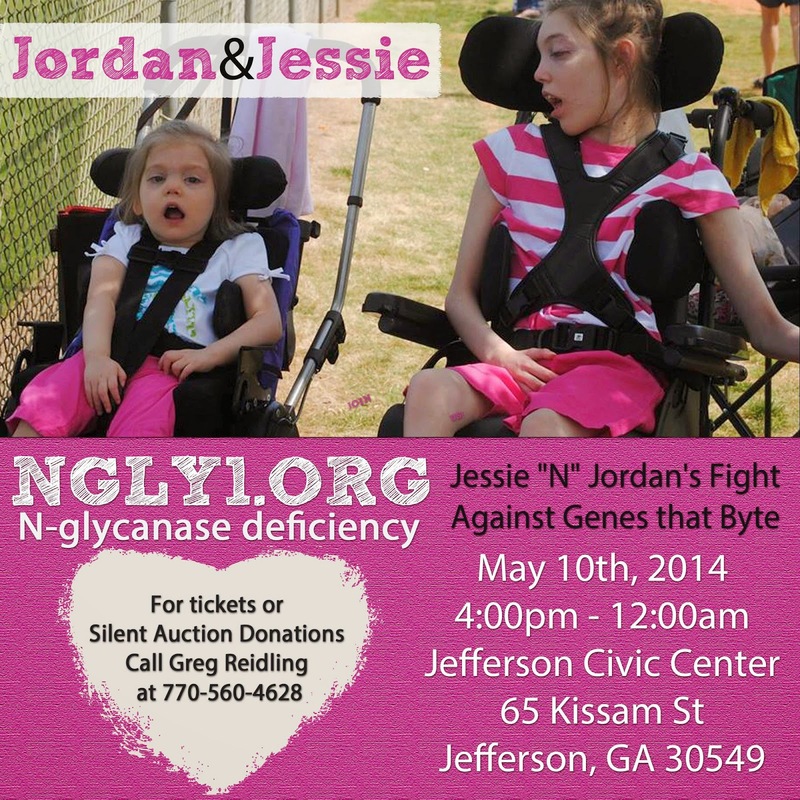 Overcoming Movement Disorder: NGLY1 Benefit for Jordan & Jessie! NGLY1 Benefit for Jordan & Jessie! The community of Jackson County, Georgia, USA is rallying around one of our amazing NGLY1 families: the Stinchcombs! The Stinchcombs have one son and three daughters. Two of their daughters have recently been diagnosed through genetic testing they both suffer from the same very rare mutation in their DNA called N-Glycanase Deficiency, otherwise known as NGLY1. There are only 9 living children in the world with this rare genetic disease. Everyday life for this amazingly resilient family is tough. Both girls who suffer from NGLY1 do not speak, they can not walk, they wear diapers, drink special formula, use wheel chairs and are completely dependent on their parents to meet all of their needs without ANY outside help. Traveling anywhere as a family or even to the grocery store, is nearly impossible. The one thing that could change the quality of life for this precious family would be handicap accessible transportation equipped with a lift and large enough to accommodate the girls' two wheel chairs and the other two children. That is the goal of this fundraiser: helping them achieve mobility so their family can function more like an every day family! Please help us achieve this goal and beyond! One $100 ticket admits two for dinner. For tickets or donation information, please call Greg Reidling at 770-560-4628.